Having difficulty choosing a hardwood species for that flooring Application? Or would you like to compare a variety of species for your special project? This should make it a little easier. 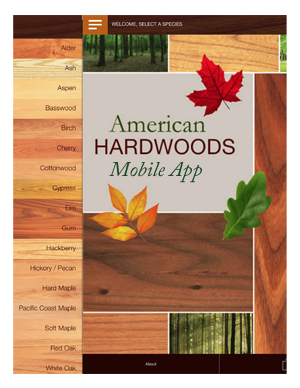 To assist in your information search, the American Hardwood Information Center announces the availability of its American Hardwoods Species Guide Mobile App. It’s new. It’s FREE. And Apple mobile device users can connect with the Apple Store here, and in minutes have the valuable design tool at your fingertips. The FREE Reference Guide application includes information about the most abundant American Hardwood Species - availability, physical and working characteristics, strength and mechanical properties, and typical applications of each. The application allows users the ability to compare species being considered for a project. Plus, a stain simulator displays the species in clear, light, medium and dark finishes to help visualize stain combinations of flooring, cabinetry, moulding and furniture co-existing in a single design space. And Species profiles include images featuring the wood in finished applications.